India's Swachh Bharat sanitation campaign has triggered many novel schemes aiming to improve the country's sanitation. Now, tech giant Google has joined the battle to clean up India's toilet habits, by mapping public toilets. 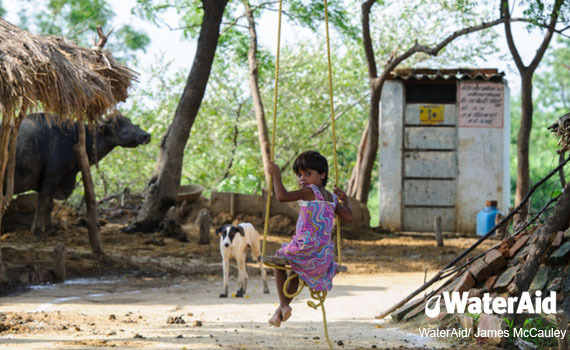 Anil Cherukupalli, Media and Communications Manager at WaterAid India, put the app to the test. India has the dubious distinction of being home to the most number of open defecators, a whopping 560 million of them, in the world! The country also has the highest number of urban dwellers in the world (more than 157 million) without access to safe, private toilets. Child from Mahadev Pura village in India. The village is now open defecation free with all households owning a toilet and using them appropriately. But India is seemingly entering a golden age of sanitation. Airwaves and public spaces across the country are inundated with messages urging everyone to keep their surroundings clean, build toilets and help end open defecation. Governments across the country are on a mission to build millions of toilets to make India open defecation free by 2019. Toilets, cleanliness and sanitation have suddenly become buzzwords. This is largely due to the Government's flagship Swachh Bharat (Clean India) campaign, which has brought a much-needed spotlight to the dismal state of sanitation in the country. This massive campaign has led to many interesting ideas coming to the fore to help improve India's sanitation situation. From promotion of low-cost toilet technologies to hiring distinctive mascots to deter people from open defecation and urination in Delhi, governments, NGOs and the media across India are all doing their bit to solve the complex challenges of ending open defecation and encouraging people to use toilets and adopt hygienic practices. Recently, global search giant Google also threw its strength behind this endeavour. In partnership with the federal government's Ministry of Urban Development it has launched a toilet search feature in its popular app Google Maps. The idea is to make searching for a toilet as easy as searching for a restaurant, bank or petrol station. Initially launched in the Delhi National Capital Region (NCR), it is expected to be rolled out in phases to cover other Indian cities. At first glance, this is one of those simple ideas that makes you wonder why no one thought of it before. Finding a clean and hygienic public toilet in India is almost as difficult as trying to find water on Mars! Public toilets are usually very poorly maintained and not easily accessible. It gets even worse when one is traveling. On Indian highways, toilets are mostly found in petrol stations or in restaurants, where maintenance is again a hit or miss affair, mostly a miss in reality. 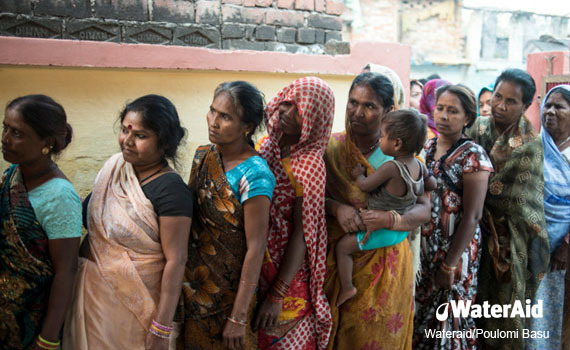 Women line up outside the community toilet, restored with support from WaterAid and the HSBC Water Programme in India. Women especially bear the brunt of this lack of clean public toilets as many public toilets are too dirty or unhygienic to use or lack water or do not offer adequate privacy with broken doors or latches. This compels them to either restrict their water or food intake or risk open urination and defecation, all of which can lead to adverse health outcomes. A recent study found that open defecation by pregnant women leads to a higher risk of adverse birth outcomes in India. The Google Maps public toilet search feature will primarily rely on crowd-sourced data for opening hours and cleanliness status of the toilets. Allowing users to share this information will hopefully help keep the feature up-to-date and reliable, and help people to choose whether to use a particular facility or not. It may also help push providers of such facilities, whether publicly or privately owned, to offer easily accessible and cleaner toilets. However, like all new technology initiatives in a country where only a few affluent sections of society have access to smart phones and internet, how effective this feature will be in practice remains to be seen. I decided to try out the feature from two locations. The first location was Sector 63 of Noida, a burgeoning satellite city adjoining Delhi in the neighbouring state of Uttar Pradesh. Sector 63 primarily consists of offices of small- and medium-scale firms. When I searched Google Maps for a public toilet there, the nearest available was shown to be about 3.5km away, 15 minutes to drive or about 45 minutes to walk. Other toilets shown were further away. Although opening hours were listed for almost all of them, reviews and photos were practically non-existent. For my second search I chose my place of work -- the WaterAid India office, in south Delhi. The closest public toilet was shown to be about seven minutes away on foot, but the photo of the exterior did not mark it out to be well maintained. Other toilets listed were further away. At this location, a few of the toilets also carried user reviews and photos. Although I could not go and check any of the toilets, it was good to see the search at least working and throwing up some options. However, the distances involved in most cases were not very practical to compel their use. There is a need for provision of more public toilets in India's cities and towns. If more toilets begin to show up and at closer distances the search feature will become more practical to use. But how to reach everyone? To reach everyone this feature should be available to slum residents too, those who are mostly dependent on community toilets. The issue is access for people who cannot afford smartphones or access the internet. Perhaps Google could address this by starting another pilot project to provide inexpensive smartphones in public and community toilets and encourage people to use them to rate the toilets immediately after use, displaying the ratings prominently on the toilets themselves as well as online. Ultimately, the toilet search feature will work best when large numbers of people, including poor people, can use it to push for improvement of public and community toilet facilities by regular sharing of ratings and photos. This would put pressure on those providing or managing those toilets to make them better. While it is still early days, with increasing usage by people from different sections of the society the feature might become more reliable and accurate over time. But it should not become yet another technology feature that is available to only those on the right side of the digital divide. The true success of this feature will be when the poor, the marginalised, women and people with disabilities can make use of it to demand safe, clean, reliable and accessible toilet facilities in their localities. By Anil Cherukupalli , Media and Communications Manager at WaterAid India. He tweets as @anilcheruk.